Highlights: A trip to Saigon offers you a great experience of the country’s most dynamic city – a vital economic hub with bustling life. 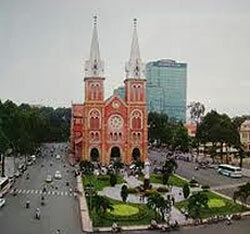 Saigon has America and Chinese influences, with many dots of modernity yet without losing Vietnamese traits. Modern office skyscrapers, amidst Chinese style pagodas and food stalls, street vendors along the street, all create a dynamic urban area with a very special sense. In the afternoon, visit the Reunification Palace, followed by exploring Notre Dame cathedral, the historical Central Post Office & XQ embroidery workshop. Optional: A/C transfer, English speaking guide. Included: A/C transfer, English speaking guide. Excluded: Personal expenses, travel insurance, drinks, entrance fee. © Copyright 2013 - 2019. Little Saigon Boutique Hotel, All Right Reserved.